Give the NFL credit: it has mastered schedule-release day. On Oct. 6, which is Week 5, the Oakland Raiders will host the Chicago Bears at Tottenham Hotspur Stadium for a 1 p.m. ET kickoff. That means the London crowd will be treated to Khalil Mack’s first game against his former team and the coach, Jon Gruden, who traded him away last summer. On Oct. 13, Week 6, the NFL will be back at Tottenham’s stadium. The Tampa Bay Buccaneers will host their NFC South rivals, the Carolina Panthers. That game will have a 9:30 a.m. ET kickoff. Tottenham's new stadium, which has a capacity of 62,000, recently opened and now has NFL-sized locker rooms as well as NFL-regulation FieldTurf. The grass soccer pitch can retract, revealing the FieldTurf underneath. 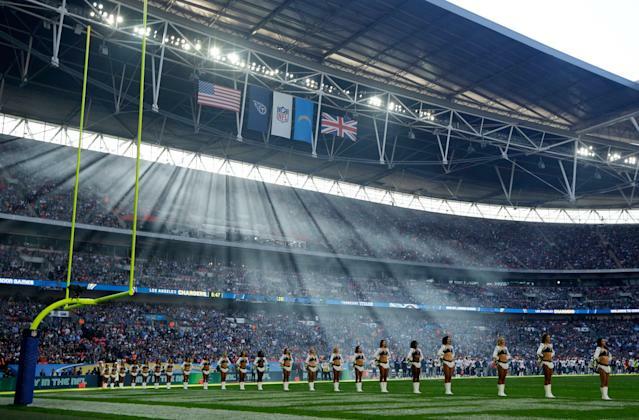 The NFL was supposed to have games there last year, but delays around the opening of the stadium meant they had to be moved to Wembley Stadium. In Week 8, on Oct. 27, the Los Angeles Rams will host the Cincinnati Bengals at Wembley Stadium. That game has a 1 p.m. ET kickoff. 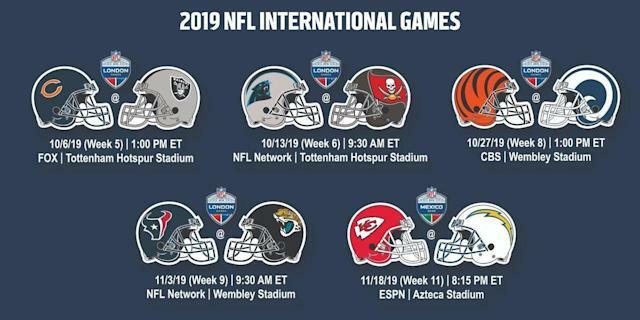 And on Nov. 3, Week 9, the Jacksonville Jaguars will host their AFC South rivals, the Houston Texans, at Wembley for a 9:30 a.m. ET start. Estadio Azteca in Mexico City will host the Los Angeles Chargers-Kansas City Chiefs game for Monday Night Football in Week 11 on Nov. 18, for an 8:15 p.m. ET start.